The past few weeks have been busy; between working outside in 12 degree weather, getting sick, and all the Christmas prep, I have hardly found time to knit, let alone blog. Never fear though! Now that the holidays are over, I have plenty of time for knitting and spinning. Christmas with my family is always enjoyable, and this year was no different. Our Christmas Eve dinner of Pirogi’s, shrimp, and salad was as delicous as ever. The pirogi’s are made from scratch that day, and are stuffed with sauteed sauerkraut, bacon and mushrooms. Christmas morning was wonderful as well- the two recipients of handknit gifts weren’t here, so I have a few more days to work on those. (I will finish 3 mitts and a sock in 3 days. It’s possible). I did however receive a few wonderful items for Gertrude- a jumbo flyer and bobbin, and a Niddy Noddy. Other awesome gifts included a spice rack, season 4 of Doctor Who, a Dalek phone charm, Star Trek, and some awesome items from my Alma Mater. I have also made a mini-resolution for my knitting- no casting on new projects for myself until all my WIP’s are complete. I currently have 9 WIP’s that I can think of off the top of my head- here’s hoping that I get cracking, because I have so many new projects I want to cast on! What is your New Years knitting resolution? This past weekend I drove out to visit my aunt who taught me how to knit. I brought my new spinning wheel, so she could help me with Navajo plying. It was my first set of singles, (8 oz of superwash merino) but I really wanted to navajo ply to preserve colors. Here was our wonderful set-up. Christmas knitting has gotten a little easier since I was sent home from work sick today and will probably be home sick tomorrow too, so my socks for The Boy and the mittens from grandma should actually make a bit of progress. The socks being in sport weight on size 2 needles helps- I’ve already gotten past the heel and cruising down the foot! I may put the pattern up on ravelry when it’s done- I think it’s a pretty cool sock. Anyway, that’s all for now. I’m off to try and stop sneezing all over everything…stupid cold. 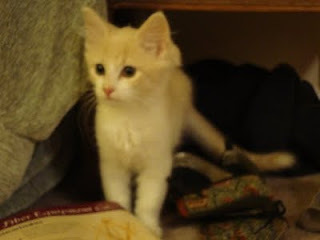 I adopted a kitten. A woman in one of my knitting groups found a litter of abandoned kittens, but couldn’t keep all 10 obviously. My cat is now living permanently with my grandparents since she bonded with their cat, and I had been feeling lonely. It seemed like perfect timing. She is about 12 weeks old now, and is a bundle of energy. I never stop laughing with her around. 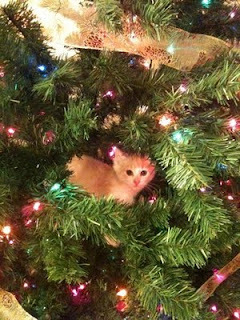 I have learned though that Christmas trees and kittens may not be the best idea. I have been spinning, and have my first ever yarn done. It was navajo plyed, and looks pretty good for my first ever yarn. (I don’t think the one spun on my spindle REALLY counts). I’ll post pictures of that tonight. I think I may also post in progress pictures of my Christmas knitting. Hopefully having to post that and update it will keep me on track for finishing them in time!